Fans of The Mortal Instruments and The Infernal Devices can get to know warlock Magnus Bane like never before in this paperback collection of New York Times bestselling tales, each with comic-style art. This collection of eleven short stories illuminates the life of the enigmatic Magnus Bane, whose alluring personality, flamboyant style, and sharp wit populate the pages of the #1 New York Times bestselling series, The Mortal Instruments and The Infernal Devices. Originally released one-by-one as e-only short stories by Cassandra Clare, Maureen Johnson, and Sarah Rees Brennan, this compilation presents all ten together in print and includes a special eleventh tale, as well as eleven comic illustrations. This book was a strange one to dive into straight after East of Eden, but like a comfort blanket of being back in the Shadow world. 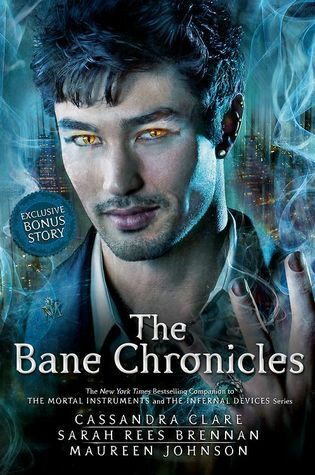 I wasn’t sure what to expect with The Bane Chronicles, but I ended up enjoying it so much! It has all of the fabulous flamboyant-ness of Magnus, and made me laugh out loud so many times. The humour was definitely the most impressive part of this book. I never really laugh out loud at books. I’ll find things funny, but rarely do I actually chuckle or laugh. But this one did. If you love Magnus (and let’s face it, who doesn’t? ), you’ll definitely enjoy this. Although short stories can sometimes be difficult and hard to get right, this collection had a certain flow. It wasn’t in a complete linear order like Tales of the Shadowhunter Academy, but it had enough of a recognisable order that it didn’t feel all over the place! The pacing was pretty spot on, too. I got through this in just over a weekend, simply because it was so easy to pick up the next story! Honestly, this book was a bit of fun. It’s nothing outstanding or breath taking, but any fans of Shadowhunters will enjoy it for sure. I found it so nostalgic and comforting to read about Magnus’ adventures throughout the years of The Infernal Devices and The Mortal Instruments, and the laughter was definitely a plus!